W. H. Leary offers their Array controller line to the corrugated boxes market produced on Flexo Folder Gluers. Leary's fully interactive gluing & quality assurance solution is designed to not only deliver quality boxes to your customers but to also increase throughput, reduce box spoilage and glue consumption. Leary's expandable systems are designed to grow with you as your requirements change. With the new Monet operating system, even systems with multiple features are easy to use and operate. The simple to use Array controller with a color LCD touch panel is easily installed for immediate use. Managing pattern and valve outputs are kept simple with the user friendly interface and software program. 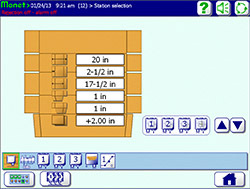 The interface accesses all control features and shows an image of the box based on measurements entered. Box measurements are taken from operator’s production sheets to easily enter box values and begin quality application and detection. All job set-ups are automatically stored according to job or item number for quick access for repeat jobs. The MasterJet gluing station has been designed for flexo folder gluers, and guarantees the most precise and reliable glue application. Our non-contact application method easily handles warped board - ensuring no skewing, smearing or wiping. Leary offers a variety of quality assurance solutions to guarantee your box quality. Choose from glue detection, hang tab / scrap, skew or jam detection working in conjunction with SureScan™ Technology. This technology accounts for every single product as it enters, travels through and leaves the production line. At any point in time, SureScan knows the exact location of every product, the product dimensions, rate of speed, which quality stations have scanned the product and how many others are due to scan it before it leaves the line, so that every product receives 100% inspection. Leary's range of controllers can activate a high speed atomizing spray head used for identifying product running through a production line. This device has a manual adjust air intake port which can increase or decrease the amount of moisture and the pressure of the spray mist. The Jet250 is generally used in applications where fast response time and positional accuracy are imperative. Our patented On-Target intelligent detection and correction technology automatically keeps the glue line positioned exactly on-target at any speed. This technology enables accurate gluing and is exclusively available from W. H. Leary. The Leary's iQ Smart Services software allows Leary Array Series systems to send real-time statistical data to a central database. All data contained in the systems' production reports are sent through the iQ network, creating archived data and allowing tracking capabilities for basic or sophisticated production analysis.